This chapter was first publicly shared on October 19, 2018; it was last updated by the author on March 4, 2019. Virtual Teaching Collection of 3D photogrammetry models of cephalopod fossils. The molluscan class Cephalopoda--squids and octopuses being the most familiar examples--includes a remarkable diversity of tentacled marine predators that use a jet propulsion system to move through the water, in some cases very quickly. While most modern cephalopods are completely soft-bodied or have only thin internal shells, their ancient shelled cousins--most often compared to the modern chambered Nautilus--left behind a rich fossil record that documents a remarkable diversity of shell shapes, from long and cone-shaped to nonsensical twisting morphologies. a beak composed of chiton (source: Tree of Life: Cephalopoda by Young et al., 2018). There are over 800 species of extant Cephalopoda (Gofas, 2009; WoRMS database accessed March 13, 2017) and these are divided into two groups. The first--Coleoidea--includes two important subgroups, Decapodiformes (squids and cuttlefish) and Octopodiformes (octopuses). The second group--Nautiloidea--is nearly extinct, but has ancient roots. Over 10,000 species of fossil Cephalopoda have been described (Paleobiology Database). Many of these belong to large clades that were once ecologically important, but left behind no modern representatives. Examples of some of these include Orthocerida, Belemitida, and especially the Ammonoidea, which rival trilobites as favorites among collectors of invertebrate fossils. These extinct clades, as well as numerous other smaller groups, are phylogenetically nested outside or among Coleoidea and Nautiloidea (i.e., they are stem groups; see Ch. 4.2.4). Because they are extinct and are mostly only known from their mineralized shells, it is challenging to understand the relationships of some of these groups to each other and to members of the extant clades. Another reason for this is that similar shell morphologies evolved multiple times (i.e., convergent evolution). Even so, available evidence has allowed a generalized picture of cephalopod phylogeny and evolutionary history to come into view (e.g., Kröger et al., 2011). Highly simplified phylogenetic hypothesis for modern and extinct groups of cephalopods based on results of Kröger et al. (2011, fig. 5). Daggers (†) indicate extinct clades. Estimates for divergences come from Uribe and Zardoya (2017). Nautiloidea is estimated to have diverged from Coleoidea about 491 Ma (range estimate 508-335 Ma); Decapodiformes and Octopodiformes are estimated to have diverged about 202 Ma (range 227-181 Ma). Image by Jonathan R. Hendricks. In this context, some extinct taxa (e.g., belemnites) are part of the crown group (see Ch. 4.2.4) Coleoidea, some are part of the Coleoidea stem group (e.g., ammonoids), while others are part of (or closely related to) the paraphyletic (see Ch. 4.2.4) Nautiloidea, which includes the modern Nautilus. Still others are members of the cephalopod stem group. Some of the diversity of each of these major groupings will be explored later sections of this chapter. A recent study by Uribe and Zardoya (2017) integrated genetic information from modern cephalopods with additional data from the fossil record to estimate the divergence times of major cephalopod groups. They determined that Nautiloidea diverged from Coleoidea approximately 419 million years ago (error range of 508-335 Ma), near the beginning of the Devonian period. Similarly, they determined that the two major groups of Coleoidea--Decapodiformes (squids and cuttlefish) and Octopodiformes (octopuses) diverged approximately 202 million years ago (error range of 227-181 Ma), at the end of the Triassic period. Many of the morphological terms applied to the shells of ancient cephalopods correspond with those of modern Nautilus, so it is useful to begin by considering the internal and external features of its shell. The shells of modern Nautilus are tightly coiled. As you will see in future sections of this chapter, however, ancient cephalopods showed nearly every other conceivable style of shell, from short-and-stubby to long-and-straight to initially coiled, then completely unwound. The image below shows some of the major external features of the Nautilus shell. Besides the coiled shell itself, the most striking feature is the shell opening, which is called the aperture (the same term is applied to the openings of gastropod shells). Individual growth lines are visible along the sides of the shell. The most recent line of growth, which traces the edge of the aperture opening, is called the peristome. The head of the animal emerges from the aperture (see photo of living animal above), so the aperture side is anterior (making the opposite side of the shell posterior). The top most surface (above the animal's head) is dorsal and the opposite (bottom) surface is ventral. 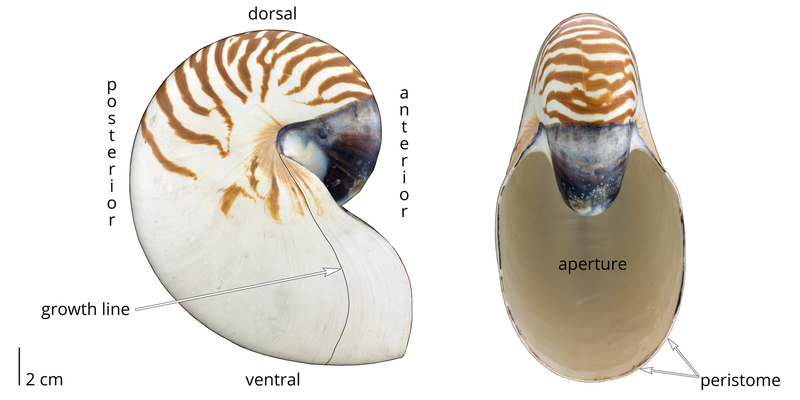 External shell features of modern Nautilus pompilius, as well as directions of orientation. Specimen is from Cebu, Philippines and is part of the collections of the Paleontological Research Institution, Ithaca, New York (PRI 70573). Image by Jonathan R. Hendricks. Interactive 3D model of Nautilus pompilius, showing external shell features (compare with image above). Specimen is from Cebu, Philippines and is part of the collections of the Paleontological Research Institution, Ithaca, New York (PRI 70573). Model by Emily Hauf. 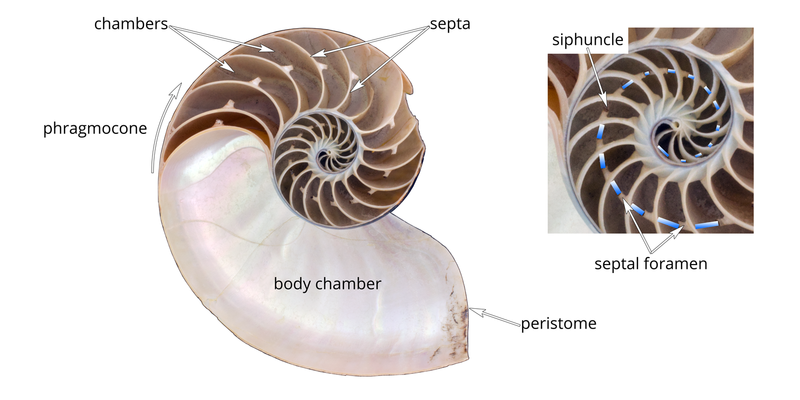 The "chambered nautilus" gets its common name from its internal shell, which is divided into a series of chambers (sometimes alternatively called camera) that are separated by walls called septa (singular: septum). All of the chambered sections of the shell are collectively called the phragmocone; the remainder of the shell--where the living animal last lived--is called the body chamber. The internal morphology of this phragmocone is likely familiar to many people, as it is commonly featured on the covers of books about mathematics, evolution, and a diversity of other topics. Its elegant coiling form is that of a logarithmic spiral. As the animal grows, new septa form, walling off previously occupied portions of the shell (forming the chambers). The chambers are connected by a soft organic structure called the siphuncle, which removes water from unoccupied chambers and then replaces them with gas. This allows the growing nautilus to remain buoyant in water. While the soft siphuncle (reconstructed below in blue) itself is unlikely to fossilize, support structures for the siphuncle, called septal foramen, are calcified and readily preserved. Even if direct evidence of it is not preserved, we assume that all ancient chambered cephalopods had a siphuncle in order to maintain buoyancy as observed in the modern nautilus. Internal shell features of modern Nautilus pompilius. Specimen is from the Philippines and is part of the collections of the Paleontological Research Institution, Ithaca, New York (PRI 70574). Image by Jonathan R. Hendricks. In the sections that follow, you will see that the chambered shell form exhibited by the modern nautilus proved to be very successful in a variety of cephalopod groups during the Paleozoic and Mesozoic. During the Cenozoic, however, external chambered shells largely gave way to groups with either internalized shells (e.g., belemnites) or no shells at all (e.g., squids and most octopuses). 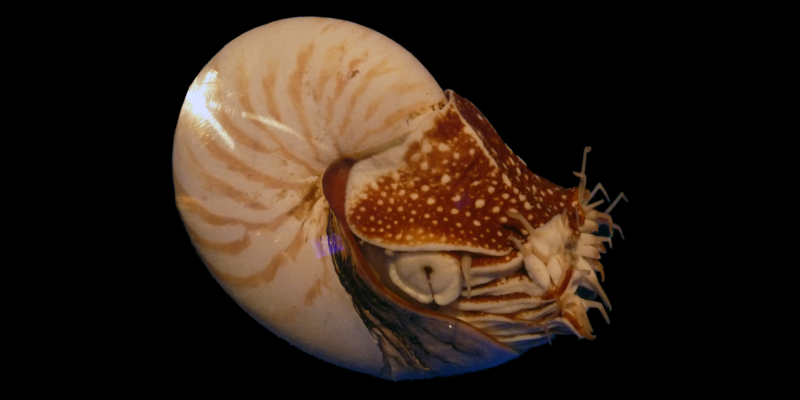 In this respect, the chambered nautilus is something of an evolutionary holdover from earlier times (i.e., a "living fossil"). While iconic, the tightly coiled shell of the modern Nautilus does little to represent the tremendous diversity of shell shapes that were possessed by ancient groups of chambered cephalopods, including other nautiloids and especially ammonoids. Some ancient chambered cephalopods had long, straight shells, some had shells that were both stubby and slightly curved, while still others had bizarrely shaped shells that defy simplistic description. Regardless of shell shape, all chambered cephalopod shells can be described in terms of their orientations of growth. The oldest part of a cephalopod shell--whether straight or coiled--is the embryonic shell, which is usually not preserved (in species with straight shells) or is obscured (in species with coiled shells). Consistent with terminology used for the shells of gastropods, the embryonic shell represents the apex of the shell. Thus, shell features that are oriented towards the apex are said to be adapical ("ad-" = towards; "apical" refers to the apex). Conversely, features that point towards the aperture--the youngest region of the shell--are adapertural (towards the aperture). 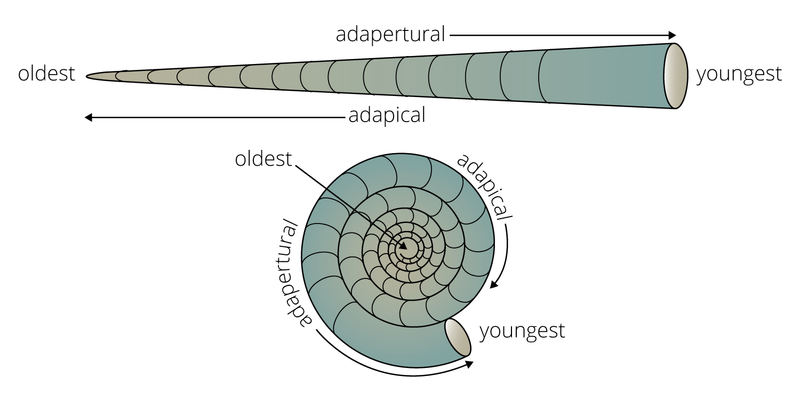 The terms adapertural and adapical are especially useful when describing the complex suture patterns of ammonoids. 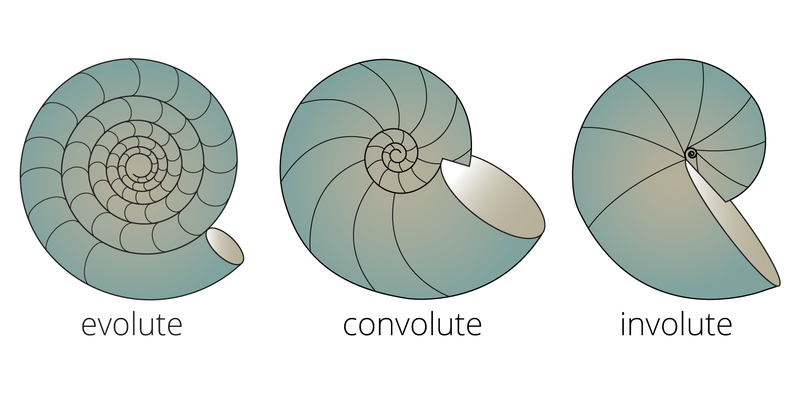 Shell orientation terminology of non-coiled and coiled chambered cephalopod shells. Image by Jonathan R. Hendricks. The earliest chambered cephalopods had shells that were not coiled. Some had shells that were short and stubby; these are called brevicones. Others had elongated, cone-shaped shells called longicones. Straight-shelled brevicones and longicones are said to be orthoconic ("ortho-" = straight), while those that have a slight curve to them are called cyrtoconic ("cyrto-" = curved or bent). 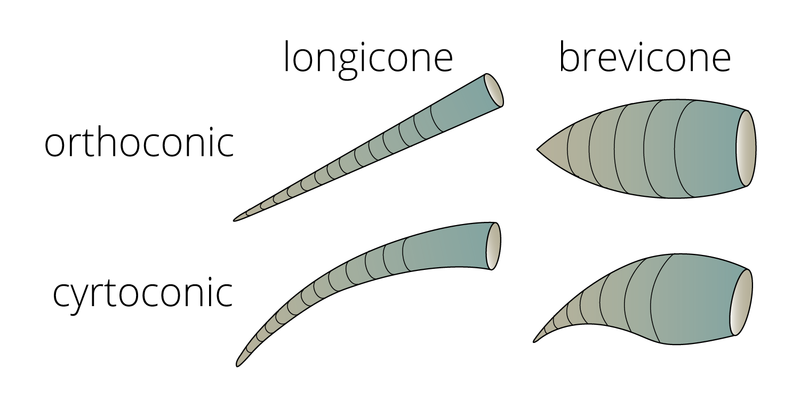 Thus, an uncoiled chambered cephalopod shell that is short and stubby with a slight curve is properly called a cyrtoconic brevicone, while a shell that is elongate and straight is called an orthoconic longicone. These terms are illustrated below. Many nautiloid and ammonoid shells are tightly coiled and grow about an axis in a single disk-like plane (they are therefore planispiral, a term that is also applied to the shells of some gastropods). In some species, younger whorls do not overlap earlier whorls; these shells are called evolute. In other species, the younger chambers partially cover earlier whorls; these shells are called convolute. Finally, some species have shells that are involute: the youngest whorls completely (or almost completely) cover all of the earlier whorls (as observed in the shell of Nautilus). 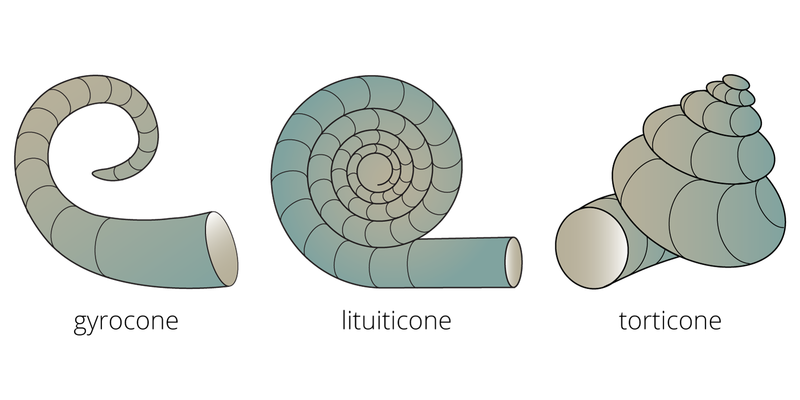 Planispiral shell forms of coiled chambered cephalopods, illustrating evolute, convolute, and involute growth. Image by Jonathan R. Hendricks. Some chambered cephalopod shells have shapes that do not easily fit into the categories above. For example, the shells of gyroconic species are coiled, but younger whorls do not make contact with whorls that formed earlier in growth, resulting in open coiling. In some species, growth is initially tightly coiled, but the coil begins to unwind later in growth, forming a shell that is lituiticonic. Still other species developed torticonic shells that broke the confines of planispiral growth and began to grow down their axis of coiling much like the shells of most gastropods. In a later section of this chapter you will learn about the even more bizarre forms of heteromorph ammonoids, some of which have twisted shell shapes that seemingly defy simple description. The next section of this chapter (Sec. 11.2.1) introduces some of the earliest chambered cephalopod groups, which are thought to be stem groups relative to all extant Cephalopoda. The paraphyletic group Nautiloidea (which includes the Nautilus) is introduced in Sec. 11.2.2 and the amazingly diverse forms of ammonoids are covered in Sec. 11.2.3. Finally, an overview of the Coleoidea, including belemnites, is provided in Sec. 11.2.4. The chapter finishes with a quiz that you can use to test your knowledge and understanding of Cephalopoda (Sec. 11.2.5). Gofas, S. 2009. Cephalopoda. World Register of Marine Species. Teichert, C., B. Kummel, W. C. Sweet, H. B. Stenzel, W. M. Furnish, B. F. Glenister, H. K. Erben, R. C. Moore, and D. E. Nodine Zeller. 1964. Treatise on Invertebrate Paleontology, Part K, Mollusca 3. The Geological Society of America and The University of Kansas Press, Lawrence, 519 pp. Young, R. E., M. Vecchione, and K. M. Mangold. 2018. Cephalopoda Cuvier 1797. Octopods, squids, nautiluses, etc. Version 20 February 2018.